Double sided tape | butyl tape | VHB tape | double sided pressure sensitive acrylic adhesive tape | strong bonding permanent moisture and vapour seal double sided tapes. super STRENGTH SOLID ACRYLIC VERY HIGH BOND DOUBLE SIDED ADHESIVE TAPE. International delivery, Brisbane, Perth, Sydney, Adelaide, Darwin, Melbourne. Hobart, Country Australia. Supply of proven quality, high bond strength double sided adhesive tapes, and flashing tapes for construction and manufacturing industries. 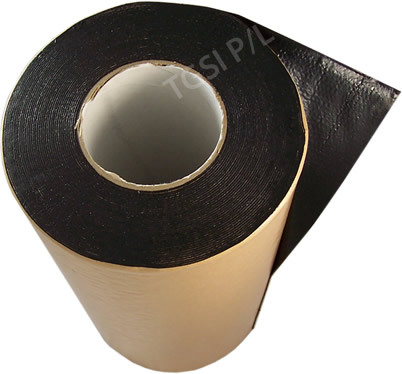 Adhesive: High water resistant butyl rubber adhesive coated on polyethylene net for dimensional stability. Conforms to rough, textured surfaces. Dimensions: 15 meter long rolls. Widths: 100mm, 320mm, custom. Physical properties: High water resistance, UV stable, strong adhesion. Vibration isolation of audio parts. Note: Most advanced butyl adhesive available on the market, easy application. Purchase online via our Non Slip Tape and Double Sided Tape Online Store. Enter Online Store. Adhesive: High tack permanent pressure sensitive acrylic adhesive (clear). Liner: Siliconised release paper, red color. Physical properties: Water resistant, UV stable, strong adhesion, excellent durability. Note: Used to bond two materials together in quick fashion. Instant high strength bonding. SuPER STRENGTH SOLID ACRYLIC VERY HIGH BOND DOUBLE SIDED ADHESIVE TAPE. Material: Solid acrylic, soft texture for extra bite. Dimensions: 24mm wide X 33m long. Thickness: 2.0mm (available on online store). Translucent color: widths: 12mm, 18mm, 24mm, custom upto 457mm. Thickness: 1.52mm thickness X 33m long, 0.64mm X 66m long. Clear color: widths: 12mm, 18mm, 24mm, custom upto 457mm. Thickness: 0.25mm X 55m long, 0.5mm X 66m long, 1.0mm X 33m long. Physical properties: High performance for the most demanding situation. Suitable for outdoor applications. See technical details below. Applications: This product is the pinnacle in double sided tapes. Commonly used in construction, sheet metal fabrication, and train, truck and bus manufacture, to replace or reduce the use of mechanical fasteners. Highly usefull for fixing posters etc. to walls. DESCRIPTION: High performance pressure sensitive solid acrylic bonding system designed to provide a superior bond to most substrates. Colour: Translucent. PERFORMANCE FEATURES: Offers users a consistent lasting bond to most surfaces along with excellent weather resistance. It does not absorb moisture, withstands thermal movement and possesses sound deadening and anti-vibration properties. Because translucent colour the tape blends into the background it is adhered to. Meets the standards required by the automotive manufacturers on petrol and oil contact. Resistant to dilute acids/alkalis and has excellent UV resistance. Passes UL 94HB Horizontal Burn Test & is compatible with most popular grades of Urethane, Silicone, solvent release butyl & all water based gun-grade sealants but will not adhere to cured silicone & urethane based sealants. WIDTHS AVAILABLE: 6mm to 457mm. SURFACE PREPARATION: This product should always be applied to clean, dry grease and dust free surface. Care should be taken to ensure that plastic components are free from release agents. Press firmly into position to obtain maximum benefit from the pressure sensitive adhesive. Optimum performance will be obtained when the bond is formed at 23OC. At low temperatures there is a chance of condensation and the tack of the adhesive can be reduced. For maximum performance on some low surface energy substrates an adhesion promoter may be required.